Bryde’s whales are one of the most poorly understood baleen whale species. Also known as ‘tropical whales’, due to their preference for waters of 16° Celsius or higher, they are found in both nearshore and open waters between the latitudes of 40° South and 40° North. Historically Bryde’s whales have been confused with Sei whales, which are larger and have a more temperate and sub-polar distribution. Further confusion is caused by uncertainty about the possible existence of two species of Bryde’s whales, which have provisionally been classified as two sub-species with partially overlapping ranges: the smaller Eden’s whale (Balaenoptera edeni edeni), and usually larger Bryde’s whale (B. e. brydei) 1,2. Another species that was formerly confused with Bryde’s whales is the Omura’s whale (Balaenoptera omurai), which was only described in 20033, and can overlap in range with both sub-species of Bryde’s whale. While the taxonomists, geneticists and field researchers work to better understand this complex of species, whale watchers can hope to catch a glimpse of them in places like South Africa, New Zealand, the Gulf of Thailand and Brazil, where their range overlaps with some other more predictable and better studied whale species. Bryde's whale off the coast of South Africa.Photo courtesy of Gwenith Penry. From a distance Bryde’s whales could be confused with other rorqual whales like blue, minke, fin or sei whales. They should be easy to distinguish from blue and fin whales due to these species’ much larger size and unique colouring. However, differentiation between Bryde’s whales, sei whales, and Omura’s whales is extremely challenging and it is known that past scientific literature and whaling records contain a number of misidentifications. While the Bryde’s whale’s head is fairly flat, the sei whale, jaw/rostrum is slightly turned down. The most reliable diagnostic feature for the Bryde’s whale, however, is the three parallel ridges running from the blowhole to the tip of the rostrum, where the sei whale and other rorqual whales only have a single, central ridge. 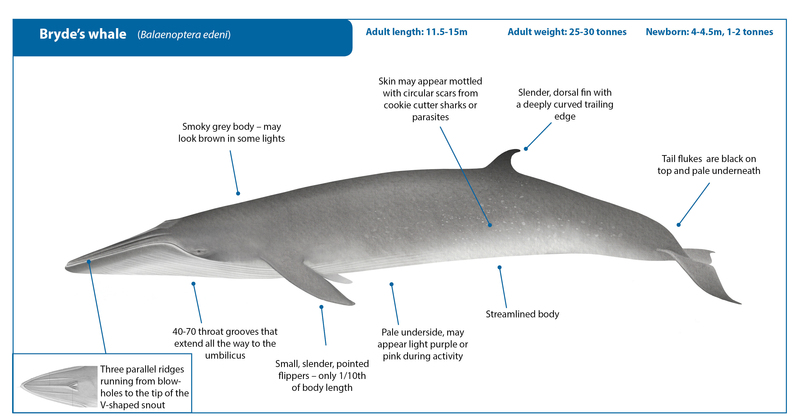 Bryde’s whales are also known as ‘tropical whales’, due their apparent preference for waters above 16°Celcius and concentration in latitudes between 40° south and 40° north. Although some seasonal movement between warmer and colder waters has been documented for some populations, others have been observed to reside year-round in coastal tropical or sub-tropical waters4,5. They can be found both inshore and offshore, and tend to be associated with areas of high productivity, such as upwelling areas. Bryde's whales are native to the following countries and territories: American Samoa; Angola; Anguilla; Antigua and Barbuda; Argentina; Aruba; Australia; Bahamas; Bahrain; Bangladesh; Barbados; Belize; Benin; Bermuda; Bonaire, Sint Eustatius and Saba (Saba, Sint Eustatius); Brazil; Cambodia; Cameroon; Cape Verde; Cayman Islands; Chile; China; Cocos (Keeling) Islands; Colombia; Comoros; Congo; Congo, The Democratic Republic of the; Cook Islands; Costa Rica; Côte d'Ivoire; Cuba; Curaçao; Djibouti; Dominica; Dominican Republic; Ecuador; El Salvador; Equatorial Guinea; Eritrea; Fiji; French Guiana; French Polynesia; Gabon; Gambia; Ghana; Gibraltar; Grenada; Guadeloupe; Guam; Guatemala; Guinea; Guinea-Bissau; Guyana; Haiti; Honduras; India; Indonesia; Iran, Islamic Republic of; Iraq; Jamaica; Japan; Kenya; Kiribati; Korea, Democratic People's Republic of; Korea, Republic of; Kuwait; Liberia; Madagascar; Malaysia; Maldives; Marshall Islands; Martinique; Mauritania; Mauritius; Mexico; Micronesia, Federated States of ; Morocco; Mozambique; Myanmar; Namibia; Nauru; New Caledonia; New Zealand; Nicaragua; Nigeria; Niue; Northern Mariana Islands; Oman; Pakistan; Palau; Panama; Papua New Guinea; Peru; Philippines; Pitcairn; Puerto Rico; Qatar; Réunion; Saint Kitts and Nevis; Saint Lucia; Saint Martin (French part); Saint Vincent and the Grenadines; Samoa; Sao Tomé and Principe; Saudi Arabia; Senegal; Seychelles; Sierra Leone; Singapore; Sint Maarten (Dutch part); Solomon Islands; South Africa; Sri Lanka; Taiwan, Province of China; Tanzania, United Republic of; Thailand; Timor-Leste; Togo; Tonga; Trinidad and Tobago; Turks and Caicos Islands; Tuvalu; United Arab Emirates; United States; Uruguay; Vanuatu; Venezuela, Bolivarian Republic of; Viet Nam; Virgin Islands, British; Virgin Islands, U.S.; Wallis and Futuna; Western Sahara; Yemen. Photograph showing the distinctive head –ridges of a Bryde’s whale in South Africa. Photo courtesy of Gwenith Penry. Bryde’s whales predominantly feed on schooling fish (including sardines, anchovies, mackerels and herrings), but they have also been documented to prey on crustaceans like krill, copepods or pelagic red crabs. Even squid remains have been detected in some Bryde’s whale stomach contents4,6. They are typically associated with tropical or subtropical areas of unusually high productivity – such as the upwelling areas off the coast of Brazil7, South Africa8,9, and the in the Arabian Sea10-12. Like humpback whales, they are active lunge feeders, and can be observed bursting through a dense school of fish with a gaping mouth and throat pleats extended. Feeding events often involve multiple other species, such as gannets, common dolphins, seals and sharks13. Feeding Bryde’s whale in South Africa. Photo courtesy of Gwenith Penry. Bryde’s whale, Gulf of Masirah, Oman. Photo courtesy of Tim Collins/Environment Society of Oman. There is no reliable information on natural predators of Bryde’s whales, although it is presumed that, as for other baleen whales, only killer whales would be large enough and strong enough to prey on these whales and their calves. Since the cessation of commercial whaling, there is very little information on current threats to Bryde’s whales. 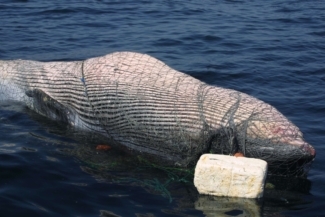 Ship strikes and entanglement in fishing gear are likely to affect this species to some degree, with documented incidents in the Arabian Sea12 and South Africa14. Purse seine fisheries for tuna have also been documented to set their nets on Bryde’s whales, which are likely to be feeding on the same small schooling fish that attract tuna. Whether or not this association leads to significant levels of mortality is unknown15,16. Inshore populations are inherently at risk due to their small population size and low genetic diversity. E.g. Gulf of Mexico population17, South African inshore population14. Bryde’s whales were not heavily targeted for commercial whaling, due partly to their mostly tropical distribution outside of the most common whaling grounds in higher latitudes, and partly due to the fact that they were smaller and less appetizing or lucrative than larger species that yielded more oil and meat. As a consequence, most Bryde’s whale stocks are believed to be relatively intact, although the long-standing confusion between species may mean that some of the catches recorded as sei whales may actually have been Bryde’s whales. A limited number of Bryde’s whale catches are still conducted in the northwest Pacific each year, under Japan’s special permit whaling programme. The historical confusion between Bryde’s and sei whales, which makes pre- and post-whaling population numbers difficult to estimate, combined with the continued lack of clarity regarding the taxonomic status of Bryde’s whale populations around the world has led to a Data Deficient classification on the IUCN Redlist of threatened species. The species is listed on Appendix II of the Convention on Migratory Species (CMS) and Appendix I of CITES. Bryde's wale tangled in fishing net in the Arabian Sea. Photo courtesy of Gianna Minton. Bryde’s whales are not often the primary target of whale watching tours due to their inherently elusive nature. However, they occur year round in many prime whale watching areas, such as South Africa18,19 , New Zealand, the Gulf of Thailand and Brazil7. Off South Africa, they are regularly encountered and photographed above and underwater during the annual ‘Sardine Run’ which attracts thousands of tourists to dive on the feeding aggregations of marine top predators. Kershaw, F. et al. 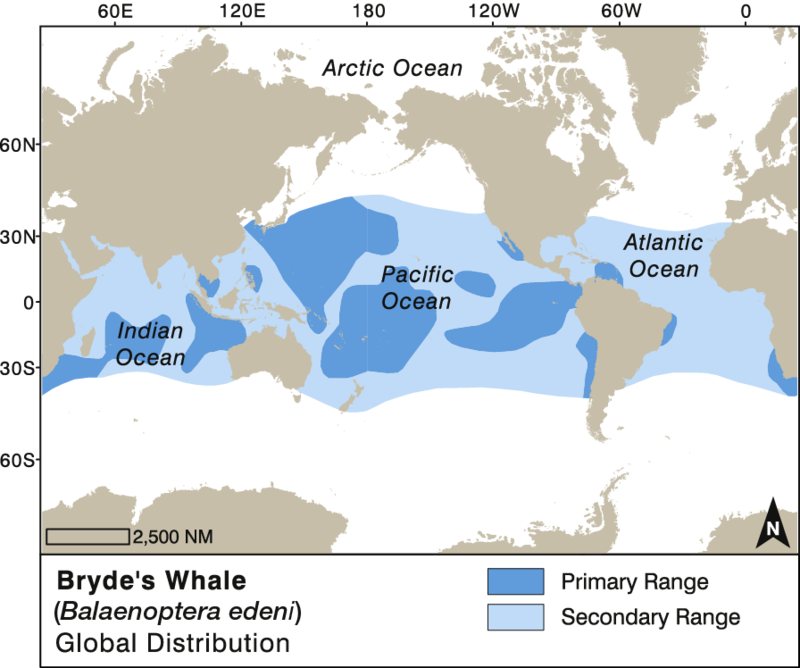 Population differentiation of 2 forms of Bryde’s Whales in the Indian and Pacific Oceans. Journal of Heredity 104, 755-764 (2013). Mammology, S. o. M. List of Marine Mammal Species and Subspecies. Committee on Taxonomy https://www.marinemammalscienc... (2017). Wada, S., Oishi, M. & Yamada, T. K. A newly discovered species of living baleen whale. Nature 426, 278-281 (2003). Kato, H. & Perrin, W. F. in Encyclopedia of Marine Mammals (eds W. Perrin, B. Wursig, & J.G.M. Thewissen) 158-163 (Elsevier, 2009). Taylor, B. L. et al. in IUCN Red List of Threatened Species (http://www.iucnredlist.org/det... Downloaded on 9 October 2017, 2008). Best, P. Two allopatric forms of Bryde's whale off South Africa. Report of the International Whaling Commission, 10-38 (1977). Tardin, R. H., Chun, Y., Simão, S. M. & Alves, M. A. S. Modeling habitat use by Bryde's whale Balaenoptera edeni off southeastern Brazil. Marine Ecology Progress Series 576, 89-103 (2017). Best, P. B. Distribution and population separation of Bryde's whale Balaenoptera edeni off southern Africa. Marine Ecology Progress Series 220, 277-289 (2001). Elwen, S., Findlay, K., Kiszka, J. & Weir, C. Cetacean research in the southern African subregion: A review of previous studies and current knowledge. African Journal of Marine Science 33, 469-493 (2011). Moazzam, M. & Nawaz, R. Arabian Humpback and Baleen Whale sightings along the Pakistan Coast: Information Generated Through WWF Pakistan’s Fishing Crew Observer Programme. Report No. SC/67A/CMP/05, 16 (Bled, Slovenia, 2017). Sutaria, D. et al. Baleen Whale Records from India. Report No. SC/67A/CMP/03_Rev, 16 (Bled, Slovenia, 2017). Minton, G., Collins, T., Findlay, K. & Baldwin, R. Cetacean distribution in the coastal waters of the Sultanate of Oman. Journal of Cetacean Research and Management 11, 301-313 (2010). Penry, G., Cockcroft, V. & Hammond, P. Seasonal fluctuations in occurrence of inshore Bryde's whales in Plettenberg Bay, South Africa, with notes on feeding and multispecies associations. African Journal of Marine Science 33, 403-414 (2011). Penry, G. S., Findlay, K. & Best, P. in The Red List of Mammals of South Africa, Swaziland and Lesotho (eds M.F. Child et al.) (South African National Biodiversity Institute and Endangered Wildlife Trust, South Africa., 2016). 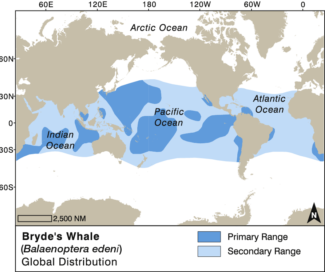 Romanov, E. V. Bycatch in the tuna purse-seine fisheries of the western Indian Ocean. Fishery Bulletin 100, 90-105 (2002). Escalle, L. et al. Cetaceans and tuna purse seine fisheries in the Atlantic and Indian Oceans: interactions but few mortalities. Marine Ecology Progress Series 522, 255-268 (2015). Rosel, P. E. & Wilcox, L. A. Genetic evidence reveals a unique lineage of Bryde's whales in the northern Gulf of Mexico. Endangered Species Research 25, 19-34 (2014). Best, P. B. A Review of the Distribution and Population Separation of Bryde's Whale off Southern Africa. 1-16 (2005). Melly, B. L., McGregor, G., Hofmeyr, G. J. G. & Plön, S. Spatio-temporal distribution and habitat preferences of cetaceans in Algoa Bay, South Africa. Journal of the Marine Biological Association of the United Kingdom, 1-15, doi:10.1017/S0025315417000340 (2017).